Shopping for an inflatable hot tub is just as easy as reading product descriptions and picking one you like. The major differences between styles of inflatable hot tubs is that some have the blower on the exterior, whereas others such as MSpa have them in the interior where they are somewhat quieter. When purchasing online, see if shipping is free or factor in the cost of shipping with the final price for comparison. You can read some product reviews, but some of those may have been placed by salespeople and others may be placed by misinformed customers, or there may have been a freight damage issue that spoiled it, which should not reflect poorly on the actual product. Reading reviews may give you more ideas of what some people did not like about it to help make an informed decision. 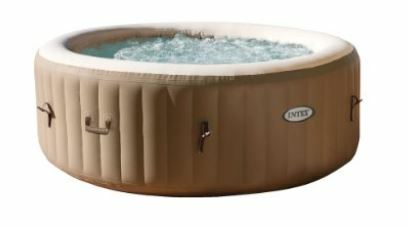 One of this year’s best sellers is the Intex PureSpa Bubble Therapy portable hot tub as pictured here. One Year Limited Warranty – Shipping weight is 100 lbs. and product dimensions: 75″ x 75″ x 28″. The new models in the Mspa line are quite good such as the Camaro inflatable hot tub. 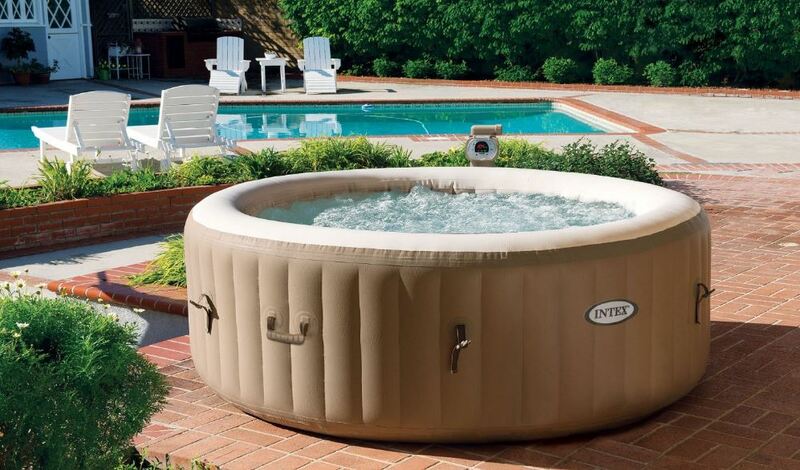 The lowest cost new hot tub for sale is the inflatable hot tub spa. Here is a list of currently available models and below are pros and cons of owning an inflatable hot tub. See our discount inflatable hot tub picks. Spa2Go, Spa in a Box, MSpa, Softub and other infltable jacuzzi and deluxe portable spas are mostly soft-sided tubs made of vinyl or plastic material for a low cost hot tub solution. Any of these can also be used as an indoor hot tub. Any blow up hot tub inflates in a matter of minutes, usually with the equipment provided. They range from the smaller 2 person hot tub to larger 4-5 person inflatable hot tubs. Inflatable hot tubs can be deflated and stowed when not in use, or brought along on most any trip. The biggest part of maintaining an inflatable spa is water care. High temperatures mean that bacteria can multiply if not kept in check with a sanitizer, or the spa needs to be refilled often. With the smaller water volume, these type of spas if used only occaisionally, can benefit from a fresh fill – but keep in mind that depending on the outside temperature, you may need to allow a day or two for the spa to heat up competely and be ready for use again. Request the best price on any of the Mspa units by email to info@hottubspatips.com as they are one of the most recommended inflatable spas for the price. Inflatable spas that use a cartridge filter element are designed to filter the water so it does not have to be drained after every use. Unlike a larger acrylic spa that can hold 2000 liters of water, it is a good idea to drain and refill these somewhat more often as the bather load per volume of water can be higher in a smaller body of water. The same impurities may be diluted more in a larger body of water, so they may be more visible in a smaller one. So clean the filter and clean out the entire tub as needed. Some inflatable spa manufactures discourage the use of chlorine or other chemicals that may be problematic with vinyl and some plastic materials. If you intend on changing the water weekly or so, then you won’t need much in the way of chemicals. You can try a little enzyme treatment or other natural, chemical free hot tub treatment. As with any hot tub, keep them warm and keep out debris by having the cover on it. Covers should also be in place for safety reasons to limit access to the spa when not in use. Inflatable spas are entry level units, so they don’t come with TV or fancy stereos, but most of them are priced well under $1,000 and they require no complicated installation or electrician to hook them up. When placed on a deck or in the garden, the inflatable spa heats the water slower than a larger spa with a bigger heater, so it is important to keep it covered until it reaches the desired temperature. On a first fill, it may take a day or two for the water to reach the set temperature, so plan ahead when bringing the spa from one location to another. There are many positive reviews by those customers who set out to purchase and then ordered an inflatable hot tub since they understand that they can save thousands over installing a large acrylic spa, but also realize the limitations of less water jets, a smaller heater and a smaller volume of water. Some also just use air bubbles instead of pumping water through a water pump, so the massage would be more of a bubbly experience vs. a therapeutic hydromassage. Inflatable spas are great after sports and activities, and you can even throw in your favorite rubber duck or other spa toys. For relaxing there are also many liquid spa fragrances that can be added to create an aromatherapy experience. Inflatables are the lowest priced version of hot tubs. The next level up would be a hard sided hot tub made of a lower grade plastic material. These also may not fare so well with sanitizing chemicals or sunlight. The most robust version of a hot tub is one made from Lucite or Aristech ABS-backed acrylic surrounded by a galvanized steel metal frame and a PVC cabinet, but the prices of these units start at just over $2,000 and can go to $5,000 or even more depending on accessories and options. A portable spa that operates on 120 volts just plugs into a standard power outlet. They are mostly made of a combination of vinyl and cloth. The quality of these materials is not as robust as an acrylic shell, but you are only paying $500-$1,000 instead of much more than that, and these units can be taken down easily and transported as needed. A vinyl repair kit also ships with most of them or is available as needed to patch any punctures in the vinyl. Read the owner manual for care instrucations as each manufacturer has a different requirement based on the materials used to make the spas. Contact us if you need an answer to any question you might have about portable spas at: info@hottubspatips.com . When in Iowa, you can visit us in our showroom and check them out in person! If you find a better deal on the marketplace for inflatable hot tubs, let us know – we may be able to match it and give you free shipping along with an extra filter. Enjoy the benefits of a hot water massage today!